I Love Clowns! I used to think nothing of clowns until I saw It. These days I can't get enough of clowns, especially scary clowns. 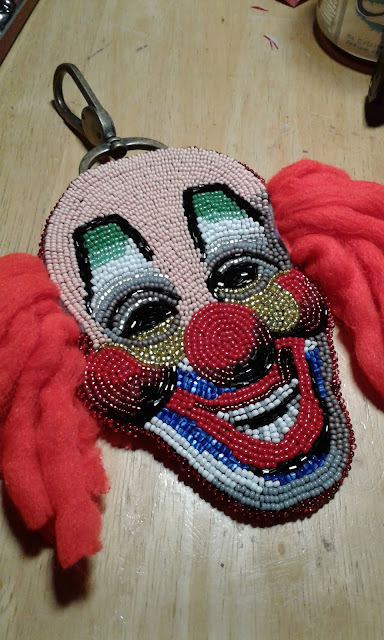 I've decided to start creating bead embroidered clowns to share with other clown fans. Here are the clown pieces I've made so far. I will add more to this list as they are completed. Unless someone special orders a clown piece, I've decided to give them away to my fellow clown addicts. I'm currrently working on a Great Milenko bag charm that has been hanging around in my U.F.O. stash. I have plans on doing a creepy Pogo after that one. Do you have any clown art you would like to share? Post a link to your clown project.
" Polyresin h 18.9"" Black Clown Please allow 1-2 weeks to ship out and receive tracking." Cloud Crown Dollface Wall Mirror I made this from a doll's head I bought at a junk store. I painted the face with spray paint and punched holes around the face to sew it down to backing material - felt. I then added a flower bouqet under the face and a crown above after surrounding the doll's face with metal cup rhinestones. I used broken jewelry pieces, glass disco ball beads, feceted black gless beads, and faceted hearts. 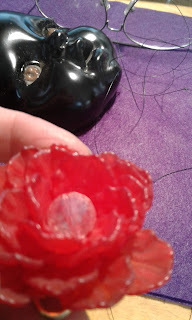 After sewing on the bigger accent pieces I surrounded them with layers of size 11 glass seed beads. Noticing the empty space in the doll's head, I decided to create a secret stash space sealed off my a zipper and velcro flap enclosure. This is the first time I've used the empty space behind a doll's head as a storage option. Who was Prince William Sound Named After? Why was it named Prince William Sound? I got curious about who Prince William Sound is named for. Obviously Prince William! Let's take a look at which prince named William it was. Okay I know it's not Prince William, Duke of Cambridge - you know Princess Diana's son. The Sound in Alaska got its first European name way back in 1778. It was first named Sandwich Sound, after the Earl of Sandwich - by the famous Captain James Cook. 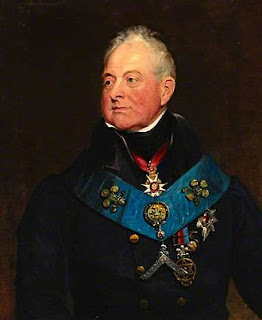 The Earl of Sandwich was a patron of Cook's expeditions. Russian explorer Alexander Baranov also named this sound Chugach Bay in 1793.